Good talk today from Karen Collins, a graduate student in U of Louisville’s Physics program. Artist’s illustration of KELT-6b, a Saturn-like alien planet announced in June 2013. From http://www.space.com/21431-saturn-like-alien-planet.html. She spoke about her work in ground-based observations of exoplanet transits, which are impressively simple but amazingly powerful for revealing new planets and telling us about already known planets. 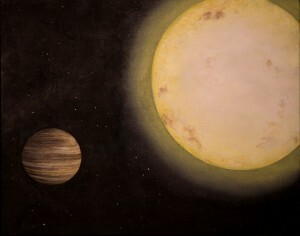 Collins helped discover and confirm the Saturn-sized planet KELT-6 b (pictured at right), in a roughly 8 day orbit around a metal-poor F-type star. This is a particularly interesting discovery because gas giant planets seem to prefer forming around metal-RICH stars, where there was more material to form planets. But KELT-6 b seems to buck that trend, and this result may point to something unusual about the planet’s formation and history.